Welcome to Pick Six. Each month, we’ll help narrow the field by picking six great beers to sample. I’ll do my best to reflect the guiding principles of Supper Club in my picks—to demystify beer for folks who may have never given it much thought. While some beers will be difficult to acquire depending on where you live, I’ll opt for accessibility, and choose a cross-section of beers from everyday IPAs to special-occasion sours. 1. New Belgium Voodoo Ranger Imperial IPA has been a staple of my beer drawer for the past two months. This hoppy 9 percent ABV beer is an affordable, nice middle ground between citrus and pine flavors with a slightly sweet malt backbone. It also tastes great knowing your money is supporting an employee-owned, woman-led B-corp that is leading the way in sustainable brewing technology. 2. Odell Brewing Wolf Picker Experimental Pale Ale is also from a Fort Collins, Colorado brewery that just expanded into the Chicago market. This beer, brewed with newly developed hops with names like OSU 331, is far less potent at 5.5 percent ABV. It goes down easier, too—with additions of peach and mango adding a smooth, fruity profile with almost no bitterness. To get this one in a bottle you’ll have to grab an Odell variety pack or get lucky at a build-your-own six pack wall like I did. 3. Marz Community Brewing Super Piña Collider is a dry-hopped black Berliner weisse with pineapple. It’s a light drink that’s designed to float on top of a white coconut stout of the same name from Pipeworks Brewing—a collaborative reinterpretation of the black and tan. I couldn’t find the stout half, so I drank the Marz half on its own. The taste was very close to pineapple juice with almost none of the sweetness and only a subtle tart pucker. For a pineapple obsessive like me, this is a beer worth seeking out. 4. Anderson Valley Brewing Blood Orange Gose has earned a permanent spot in my refrigerator from the nearly 30-year-old California brewery. Its take on the tart, sea salt, and coriander beer style is so refreshing and pairs with almost any food you might drink white wine with. In 2014, when Anderson Valley became the first brewery to can a gose year round, it seemed like a long-shot bet on a near-extinct beer style. Now I wouldn’t be surprised if it becomes the flagship beer before long, just as Off Color Brewing’s 2014 gose, Troublesome, has been for that brewery. 5. The Monarchy Brewery Preussen Weisse is a style, like gose was three years ago, that you have probably never tasted. That’s actually the focus of The Monarchy Brewery of Cologne—reviving forgotten German beer styles. I’m not so sure this one has the wide appeal of gose—it tastes more like a Berliner weisse with a huge infusion of cloves and a little hint of juniper. But in this transitional time of year, it does have its place. The two ends of the flavor profile seem to be simultaneously pulling us back into cold-weather flavors of spiced wines and pushing us forward into warm weather refreshment, with the light body and slight sourness of the weisse. 6. Coronado Brewing Islander IPA is a straightforward West Coast IPA that hits all the right notes: a 7 percent ABV and semi-sweet malt flavor with a strong hop character that doesn’t shy away from bitterness, but also evokes fruit flavors without actually adding them to the brew. If the weather doesn’t cooperate, at least you can buy this little bit of sunshine in a can. 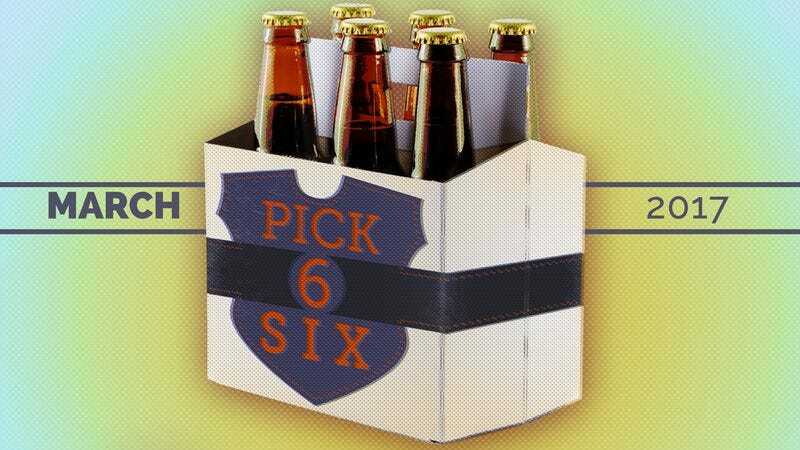 If you have a beer you’d like considered for Pick Six, send us an email at avclubbeer@gmail.com.